Unlike most athletes, Kaepernick didn’t gain national and global attention for his sporting feats. He rose to fame in 2016 for his vocal protestation of racial injustice and African American deaths at the hands of the U.S. police. Indeed, he was the first player to "take a knee" during the American national anthem before the start of an NFL game. Kaepernick’s move has been the subject of significant backlash. Commentators and political figures have encouraged Kaepernick to "leave America", that he is "un-American" and that politics has no place in sport. Perhaps unsurprisingly, President Donald Trump has weighed in on the Kaepernick discussion, saying that if a player kneels during the national anthem, they should be “fired” by NFL club owners. These views are typically underpinned by the idea that disrespecting the national anthem is wrong, or that African Americans are not being unfairly targeted by the police. By sponsoring Kaepernick, Nike has faced strident attacks from his many detractors. Some have characterised the marketing arrangement as forcing them to "choose between their favourite shoes and their country", while others have taken to burning their Nike shoes to demonstrate their anger at the global brand for endorsing Kaepernick and his views on America’s treatment of African Americans. Criticism of the sponsorship has almost exclusively emanated from extremely conservative sources. However, it is important that others do not fall into the trap of believing that Kaepernick's association with Nike is a positive development. Perhaps it may raise the profile of Kaepernick's important and timely cause – it may even further embed it into the minds of unaware, apolitical individuals – but its corrosive effects on culture and social relations should not be underestimated. 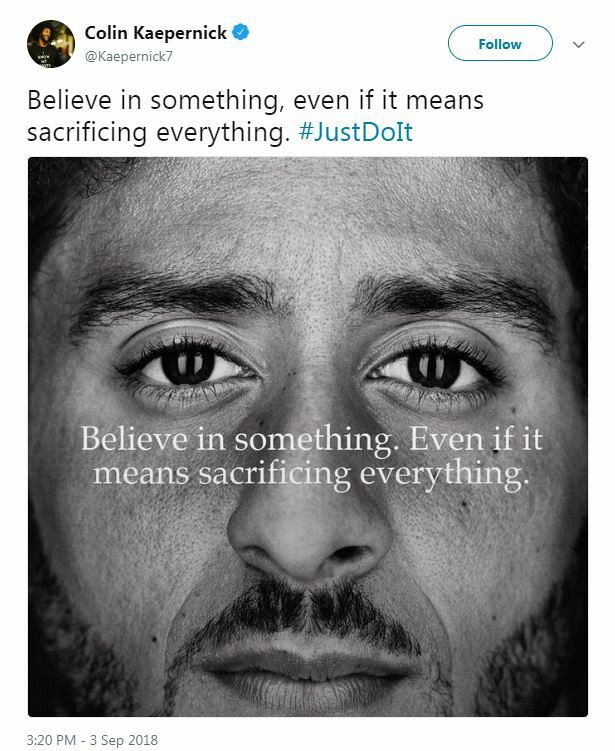 Inevitably, Nike’s shallow yet omnipresent catchphrase “Just Do It” appears on the Kaepernick announcement image. And it's clear that Nike is not merely altruistically supporting Kaepernick's struggle for racial equality and an end to African American deaths inflicted by the police. Rather, it is trying to appropriate it for sales; to exploit the controversy around it to gather more attention for its brand. This is not new territory for Nike: its very existence is predicated on aggressive and pervasive marketing strategies, as noted frequently in Naomi Klein’s No Logo. This is no doubt a good move made by Nike's head and its marketing teams. It further pushes the brand into the news headlines and continues to raise its profile. But Kaepernick’s ambassadorship with Nike is decidedly destructive to genuine public discussion and social change. It's all too symbolic of an era where the corporation knows no bounds — where corporate life is able to seep into any matter, event or cause, regardless of its seriousness or magnitude. Nike's support of Kaepernick is not a sign of progress. It is a cynical attempt to reduce the issue of African American deaths to a profit-making exercise. Even if Nike did not have a long record of human rights abuses, through substandard labour conditions that were tantamount to slavery, this deal with Kaepernick would rightly raise significant questions. But with Nike's tainted and chequered history in mind, one cannot help but reach the conclusion that this is a deeply disconcerting arrangement. One that is representative of the all-encompassing power of corporations to wrestle discourse and collective action away from the public. To best capture the absurdity of the times we’re living in, one might turn their mind to an example. Imagine if Martin Luther King Jr, in his famous address in front of the Lincoln Memorial, said, "I have a dream ... that we all 'Just Do It.'" This is comparable, if not the same, to Nike’s latest advertising campaign. Nicholas Bugeja is an Arts/Law student at Monash University. He edited the Monash student magazine Lot’s Wife in 2017 and has written on topics such as film, politics, comedy and theatre for a variety of publications.